The IBBA is a not-for-profit Trade Organization concerned specifically with the issues of butterfly breeding, releases, education, exhibition, scientific study of the butterfly world, and many other aspects of lepidoptera. All IBBA Members are asked to abide by this ethical code. Butterfly people are a different type of person in the respect that they pay attention to detail, willingly adhere to strict guidelines of ethical breeding and handling of butterflies, have a thirst for more knowledge in the field, and are always looking for new and better ways to enhance their expertise. Lucy's Butterfly Farm provides Painted Lady and Monarch butterflies for release at celebrations of life, funerals, memorials and fund raisers. 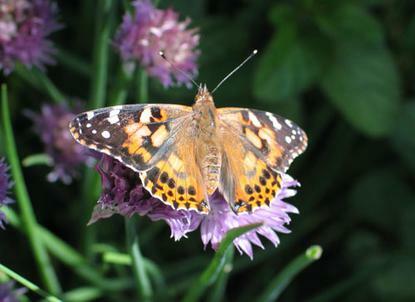 Create a joyful and inspired experience for your celebration by releasing beautiful Monarchs or Painted Lady butterflies. 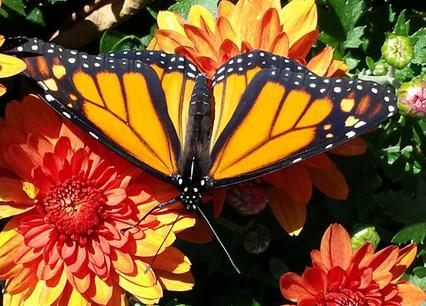 Releasing butterflies can add an extra special unique touch to your memorial ceremony. Please email for information on available butterflies. Celebrate with a Butterfly release! The butterfly is a beautiful symbol of new beginnings and hope. Butterfly releases are ideal for weddings. 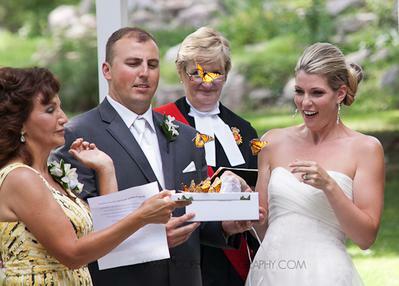 Imagine adding a live butterfly release to your special day. Create a unique memory you and your guests will cherish.